Baker’s percent is a mathematical method widely used in baking to calculate the amounts of macro, minor and micro ingredients. It’s based on the total weight of flour a formula contains. Instead of dividing each ingredient’s weight by the total formula weight, bakers divide each ingredient by the weight of flour. Baker’s percent is useful for quickly assessing if a formula is drier, saltier, sweeter, etc. 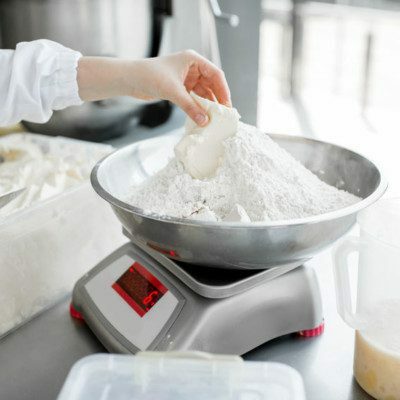 Baker’s percent is internationally used to express formulas for bakery products such as pan bread, buns, rolls, cookies, cakes, crackers, doughnuts, etc. How does baker’s percent work? In baker’s percent, the weight of the flour is always 100%, and the total percent of all the other ingredients is always greater than 100%. This concept is completely different from the True or Conventional Percent, where the combined ingredients total 100%. Y: water, yeast, sugar, salt, fat, milk solids, redox agent, emulsifier, etc. The greatest benefit to using baker’s percent is that the baker can change the amount of any ingredient at any time, without the need to refigure the percents of all other ingredients. This is very useful when formulating new products, adjusting processing parameters, and customizing old recipes to fit modern dietary guidelines. Divide the desired or total batch weight by the total baker’s percent (in decimal form). This gives the weight of flour. Multiply the baker’s percent of each ingredient (in decimal form) times the weight of flour. This gives the weight of each ingredient needed to make the desired batch. By using baker’s percent, a baker can predict crumb structure from the dough water content or hydration. For example, 80% hydration (8 parts water to 10 parts flour) often leads to an airy and irregular crumb such as in Italian Ciabatta bread while 60% hydration (6 parts water to 10 parts flour) yields denser and closed crumb similar to American-style bread. More accurate predictions can be made when hydration numbers are combined with information on type of flour used. Scaling/metering equipment used in automated production lines can be designed and configured to work with set points based on baker’s % or true %. The chosen method in this case could be a function of precise control on the exact water absorption value of flour, as other ingredients (e.g., sweetener syrups, molasses, cream yeast, eggs) also contribute with some water to the final dough. Gisslen, W. “Basic Professional Skills: Bakeshop Math and Food Safety” Professional Baking, 7th edition, John Wiley & Sons, Inc., Hoboken, New Jersey, 2017, pp. 15–25. Suas, M. “Appendix B: Baker’s Percentages” Advanced Bread and Pastry: A Professional Approach, first printing, Delmar, Cengage Learning, 2009, pp. 995–999. Labensky, S.R. “Artisan and Yeast Breads” On Baking: A Textbook of Baking and Pastry Fundamentals, 3rd edition, Pearson Education, Inc., 2016, pp. 189–192. Gisslen, W. “Rich Yeast Doughs” Professional Baking, 7th edition, John Wiley & Sons, Inc., Hoboken, New Jersey, 2017, pp. 222–223. Baker’s percent (BP) is only applicable to baking systems that do not contain high amount of fiber and other non-wheat flours or grains. This is because most dough conditioners using BP dose for wheat flour. When wheat flour is replaced with fiber, grains and non wheat flour, dosing using BP is not effective anymore. This is because fiber, grains and non wheat flour affects water absorption and rheological properties differently from wheat flour. Therefore, if your formula contains a high proportion of non wheat flour or fiber/grains, I recommend using the total formulation method to manipulate your formulas, not BP.